It’s not often you find something that’s orange, about 4 inches big and nice to touch. But here it is – the HTC 7 Mozart! But does it live up to its status as the Orange-Windows flagship smartphone? First, let’s examine the handset: it’s mostly all screen: with a 3.7” LCD display, this is a simple and clean-looking little mobile. It uses an onscreen touch keyboard and three more touch sensitive buttons below the screen for Back, Windows menu and Search options. These keys are delightfully touch-responsive. Perhaps too much so. It’s easy to accidently touch them and be taken straight into a web search, for example, when using the on screen keyboard, which can be annoying. They do look very sleek, though. So, it looks simple, shiny and chic. But it’s what’s inside that counts. So what about the meaty parts? Well, the HTC Mozart’s Unique Selling Point lies in its Dolby sound (hence, Mozart). It offers great quality, wide sound, even when using headphones. Add this to the crisp, bright picture offered by its big screen, and you’ve got a fantastic handset for listening to music and watching movies. It’s also got a speedy 1GHz processor at its heart. Nice. The Mozart’s camera is also a good’un. Its 8 mega pixels and Xenon flash make for great quality photos. The only problem is the amount you can store. The phone comes with 8GB of internal memory, but without the option to store anything on an external memory card, not a great deal of media can be captured and stored on the phone. The Windows operating system isn’t as scary as it might sound. It’s understandable to be cautious of the OS when there are lovely, shiny iPhone and Android competitors out there. And it doesn’t help my preconceptions that the last Windows phone I used was an early one that attempted to emulate the PC style, to an effect nothing short of horrible. 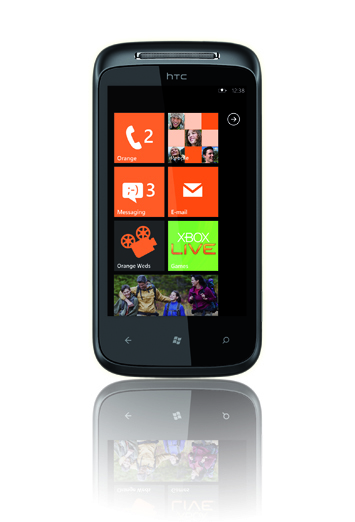 But thankfully, the HTC Mozart is a fantastic example of how far Windows phones have come over the years. Much like the handset design, the operating system and navigation is simple, sleek and above all, very user friendly. Menus and home screens aren’t as customisable as say, its HTC Android counterparts, but the tiled homescreen is nonetheless nice to look at and easy for anyone to pick up and understand. The problem with the HTC Mozart is the Windows Marketplace. It’s not got the most apps on offer. Perhaps that’s understandable and anyone considering a Windows phone should accept that and get over it, but I can’t help but compare it to its iPhone, Android Market and Ovi store counterparts. Then again, I’m a total Android convert, so maybe I’m looking at this through lime-tinted glasses. What’s frustrating about it all though, is that the market shelves are relatively bare because Microsoft have gone ahead and banned open source software from the Marketplace. This is probably the only real hurdle where the HTC 7 Mozart falls against its iPhone and Android rivals. Although there are some big name, well-developed apps on the market – including Ebay, Twitter and Shazzam – the lack of open source software makes the Windows Marketplace seems a little fledgling, and frankly, claustrophobic. Still, the phone has got some great apps. Not least the ones that come with the handset. Microsoft Office comes ready-installed, so its possible to create (but easier to just open and edit) Excel, Powerpoint and Word documents. The phone also comes with Zune, Microsoft’s rival to the iPod. It works very similarly to iTunes too, which means its easy to update and use. Especially with the option of wireless connectivity to your PC music library when you’re separately charging the handset. Which is nifty. The Windows Marketplace also allows for you to pay for apps on your phone bill. This proves infinitely easier than, for example, the credit card billing system of the Android market. The Mozart also allows real ease of connecting with Xbox Live and social networking accounts. The ability to connect your Xbox Live account with the Mozart is particularly handy to keep track of your profile, gamer scores, and see friends that are online. In the way of social networking, as well as being able to downloaded official apps for Twiiter and Facebook, the Mozart comes with the People Hub. Taking the rough idea of the Android’s social networking app Friendstream and improving on it, this syncs and combines contacts from Gmail, Facebook, Windows Live – although not from Twitter as Friendstream does. It is a delight to navigate through, though. It’s a shame that the phone is let down by a lack of external memory, which doesn’t allow the best use of the Mozart’s opportunity for music and video viewing. All in all, the HTC 7 Mozart is a user-friendly, smart and reliable handset. The Windows operating system won’t give you the open-source app store of the Android Market, but it will make a simple, good-looking phone with the bonus combination of a big, clear screen and good quality audio-visual capabilities. Glad to be of help Andy… Windows Mobile 7 is definitely a massive improvement to past platforms!